Are Custom Orthotics Really Better Than Store-Bought Insoles? One of the top options we have to help our patients overcome painful conditions is orthotic therapy. This particular treatment uses versatile devices to address many different types of lower limb issues. 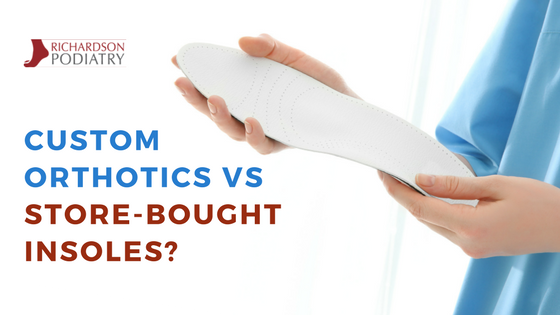 Given that orthotics are inserted into a patient’s shoes, it’s a common misconception that custom orthotics and insoles (or “inserts”) are the same thing. That is simply not the case! In this context, insoles refer to non-prescription inserts purchased at retail stores or over-the-counter at pharmacies. These shoe inserts may provide extra cushioning or arch support, but are not intended to actually treat foot and ankle problems. Conversely, orthotics are prescribed medical devices customized for a specific patient and used to correct biomechanical issues and provide additional support for the entire foot. These devices are crafted to precisely match the contours of a patient’s unique foot. They are used to treat a wide range of medical issues as diverse as bunions, cavus foot (high, rigid foot arches), hammertoe, metatarsalgia (forefoot pain), and plantar fasciitis. In addition to medical conditions, orthotics can be used to regulate pronation patterns. Pronation is a completely natural, biomechanical process feet go through with every step. Essentially, this process takes place during the ground portion of each step and consists of an inwards rolling motion. For a foot with a normal arch height, this inwards roll is about fifteen percent. An important purpose of pronation is to properly distribute the incredible amount of force placed upon the landing foot (at least one-and-a-half times your bodyweight when walking and as much as seven times when running!). Not everyone’s pronation pattern is the same, and this can be dependent upon unique foot structure. For some people—particularly those who have flat feet—pronation is excessive (overpronation). For others—mostly those who have excessively high foot arches—the pronation is not as much as it should be (supination). Overpronation and supination are problematic because they result in an unequitable distribution of force loads. When gait issues like these are present, certain areas in the lower limbs end up enduring more pressure than what they are intended to absorb, and that can cause problems. Whereas insoles bought over-the-counter may be able to provide some additional support, they are not customized to take into account your actual arch height and pronation pattern. Custom orthotics, however, can be prescribed to work with your unique foot structure and address any gait abnormalities. Generally speaking, orthotics are either functional or accommodative. If we need to treat your pronation problems, we are going to use functional orthotics constructed from sturdy materials that will restrict abnormal motion. Accommodative orthotic devices are softer and can be prescribed to provide additional cushioning for toes, feet, or ankles. Custom orthotics might be part of the treatment plan we create to address foot pain or restore functionality, but we have many other nonsurgical options as well. If you are suffering from foot or ankle pain, contact Richardson Podiatry Center and we will work to create a treatment plan for you. Call us at (972) 690-5374 to request your appointment!